Due to Hurricane Florence, the application deadline will be extended to Sept 21. Late application deadline Sept 28 (additional fee applies). 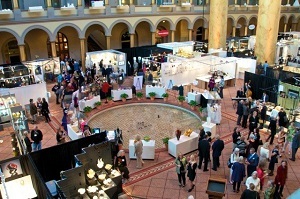 The Smithsonian Craft Show is a most prestigious juried exhibition and sale of contemporary American craft in art and design, held annually in Washington DC. Three jurors who are experts in the field and newly selected each year choose 120 artists from a large pool of applicants. Previous exhibitors must re-apply each year. No one is grandfathered into the show. There is no quota for any category of Craft Art. Artists are selected on the basis of the originality, artistic conception, and quality of their work. The show is produced by the Smithsonian Women's Committee. Proceeds from the Show fund grants that benefit the Smithsonian's education, outreach, and research programs. Electronic applications are due by September 14, 2018. The fee for applying is $50. NOTICE: The application fee is non-refundable and due at the time you fill out the online application and accept its terms and conditions. LATE APPLICATIONS will be accepted until September 21, 2018 (midnight Pacific time). The fee for late applications is $75. The late application fee includes the basic application fee of $50 and a late penalty of $25. The $75 fee must be included with all electronic applications submitted after September 21, 2018. Late electronic applications will not be accepted after September 21, 2018. The Smithsonian Craft Show is committed to presenting the most thoughtful, original, and skilled American craft and design objects. The Craft Show is looking for artists who produce one-of-a-kind and limited edition objects that have been conceived and perfected by the artist's own hands and created in the artist’s studio. All work submitted to the Smithsonian Craft Show must be created and made in the United States. The Smithsonian Craft Show encourages artists to continue to grow and stretch the limits of their media. The exploration of new and innovative technology has historically been a part of craft practice. New technologies such as computer-aided design and manufacturing (CAD/CAM) are increasingly prevalent in the designing and making of contemporary studio crafts. Because we recognize that new technologies are increasingly helpful in this process, it is acceptable to submit work in which CAD/CAM and other industrial techniques such as 3-D printing tools are used in the creative process. But it is not acceptable when these technologies are used to actually make the final product. Repurposed materials, including found objects, are being used as art material to make some craft pieces. This is a desirable practice, and artists who incorporate repurposed materials are encouraged to specify this in their statements. Only U.S. residents who make their work in the U.S. are eligible to apply. Basketry, ceramics, decorative fiber, furniture, glass, jewelry, leather, metal, mixed media, paper, wearable art, and wood. The following categories are not included in the Smithsonian Craft Show: Objects created using 3D printing technology, paintings, prints, graphics, photography, mass-produced work, soap, or objects made from commercial kits. In addition, works that incorporate materials and parts acquired from the killing of endangered species (e.g., feathers, tusks) or elephant or mammoth ivory do not qualify. Nor do arrangements of dried or silk flowers, bonsai, or embellished commercially-made objects (e.g., t-shirts, note cards, etc.). The Smithsonian Women’s Committee reserves the right to examine applicants’ web pages and any available documentation to determine that an artist is in compliance with the terms of our application. The Smithsonian Women's Committee recognizes outstanding work exhibited at the Craft Show by presenting a number of awards. The awards include Gold, Silver and Bronze levels of distinction, Excellence within select categories (such as jewelry, glass, ceramics, etc. ), as well as several Exhibitors' Choice Awards. Cash awards range from $500 to $1500. "Honoring the Future Sustainability Award" of $1,000 will be offered for the fourth year. The purpose of this award is to educate the public about climate change and to inspire and model sustainable responses to this problem. Each applicant must submit an application, the non-refundable fee, and five (5) electronic images for consideration by the jury. The images must be fully representative of the work you will sell at the Craft Show. Minimum image resolution should be 300 dpi and 1400-4000 pixels on the longer dimension. Artists are encouraged to update their portfolio with new images and consider improving the quality of previously submitted images to meet these specifications. Craft artists who work together may apply as one if they collaborate on every piece of work. If you enter in more than one medium, you must submit separate applications, fees, and slides for each category for which you wish to be considered. If only one application is accepted, you may only exhibit work in that medium. You may not enter the same piece of work in more than one category. The 120 top applicants with the highest scores will be invited to exhibit. You will be notified of your status directly after the jury's decision. If you applied electronically, you may look up the status of your application(s) online by clicking on the Manage Application function of the Juried Art Services web site. The Smithsonian Craft Show website will post a 2019 Exhibitors’ Directory as soon as jurying is complete. The site will include the 5 images submitted by each artist, with titles and dimensions. Information and images will be taken directly from the Juried Art Services website. 4. Correct identification for your images. 2019 Craft Show booth fees ranged from $1,265 to $1,965 depending on size and location of the booth. Craft artists who work together and apply as one entity pay only one booth fee. All other artists must pay the full booth fee even if they choose to share a booth with another craft artist. Exhibitors must supply their own booth structures. The Smithsonian Craft Show will supply electrical outlets. The Smithsonian Craft Show provides security. However, you will exhibit all work at your own risk and should carry appropriate insurance. An overnight lock-up is available to jewelers for a minimal fee. The Smithsonian Women's Committee, the Smithsonian, and the Smithsonian Craft Show will not be held responsible for damage, theft, or loss of your work or that of any other craft artist. The Smithsonian Craft Show complies with the American Disabilities Act to enable all craft artists to participate fully in the Craft Show. All applicants are required to submit an artist statement limited to 1000 characters. Include information regarding the use or application of environmentally friendly materials and techniques in your work if applicable. If applying in mixed media, please explain why. You will be able to check your application after you have set it up in the system. This feature enables you to access your application as it will appear to the judges and: 1) edit the copy submitted up until September 21, 2018; 2) verify that your payment has been received (if you find your payment has not been received, please call the Smithsonian Women’s Committee Office at: 888-832-9554); and 3) find the results of the jurying process. Results of the jurying process will be emailed to each applicant by Thursday, November 15, 2018. Thank you for applying to the Smithsonian Craft Show.